Out in the wilderness, in the middle of a highway, you can see Subodh and Dipika candidly posing post their marriage ceremony. 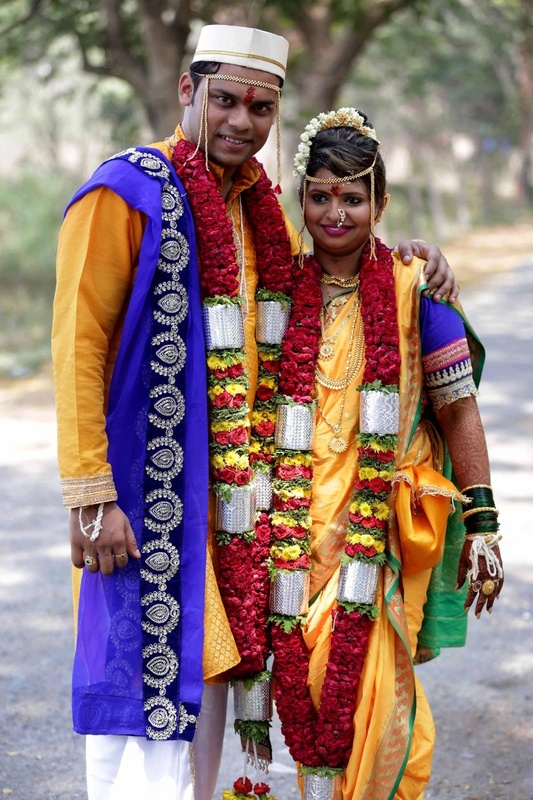 This Maharashtrian bride and groom wore matching traditional wedding outfits - Looking at them one can only say that they eloped post their wedding to get some awesome photographs amidst nature. Standing tall and strong in a yellow kurta and pyjama was the Maharashtrian groom- Subodh. He had a purple shalu that added a spiritual touch to the wedding attire. Dipika was draped in an ethnic nauvaari saree with a purple blouse. She wore a green shalu that symbolized prosperity. Both, the bride and the groom had a delicate mundavlya on. The bride wore a gajra, black shades and a gold nath to complete the wedding look and the groom wore a plain Gandhi topi. The couple also wore a matching heavy rose wedding garland. Ever shot of their photoshoot, from leaning against the tree to the adventurous bike pose with Dipika in command was taken by Sachin Prakash. Let’s have a look at their post wedding getaway!